“It’s all connected.” We know that already, those of us who work on making the world a more sustainable, resilient, fair and prosperous place for all. And we know that the 17 Sustainable Development Goals, adopted by all nations in 2015, are “indivisible” — a highly integrated web of challenge. We only succeed, as an intelligent species that now controls the destiny of a whole planet, if we achieve all the goals together. But exactly how is “everything connected”? And how do we know which connections are the important ones, the ones we simply must keep in mind, while others can rest a bit in the background? 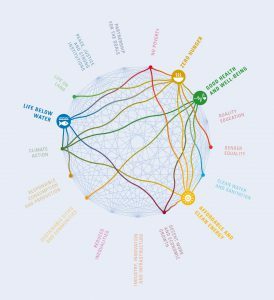 Before you start worrying about being overwhelmed by complexity, let me reassure you: this ICSU report is not an encyclopedic study of how “everything is connected to everything else.” The report picks four SDGs, as case studies and examples, and then provides a very clear conceptual roadmap for understanding how those Goals and their Targets are linked to others in the SDG system. The report even scores those linkages, using an easy-to-understand scale: plus 3 to minus 3, where “+3” means that two different objectives are “indivisible” and utterly dependent on one another, a “+2” means that one Goal or Target “reinforces” the other, and so on. A score of “-3” for a pair of goals means that making progress in one can “cancel” progress in the other — and perhaps cause things to get worse. You can search the report or scan the infographics to find out how your favorite SDG or specific Target shows up in this fascinating mapping exercise. Consider one of my favorites, SDG 14, which the ICSU authors take on as the fourth case study. (As any regular reader of this column knows, I am trying to get everyone to think about the ocean these days.) The authors assess SDG 14, the “oceans goal”, as having its strongest linkages to issues of poverty, food, economic growth, cities, production and consumption, and climate (SDGs 1, 2, 8, 11, 12, and 13). At the “deep dive” level, they find 97 relevant systemic interactions among the SDG Targets: 61 positive, one neutral, and 35 negative. But here is an important point: “negative” does not mean “incompatible.” The authors are explicitly not saying that a score of “-3” means you can’t possibly achieve the first goal without destroying the possibilities to achieve the other. This analysis found no fundamental incompatibilities between goals (i.e. where one target as defined in the 2030 Agenda would make it impossible to achieve another). However, it did identify a set of potential constraints and conditionalities that require coordinated policy interventions to shelter the most vulnerable groups, promote equitable access to services and development opportunities, and manage competing demands over natural resources to support economic and social development within environmental limits. In other words, achieving some of these goals and targets at the same time is hard, but not impossible. In some cases, they require extra effort to manage the interactions so that they become synergies instead of zero-sum games. Business as usual will not work in those “-3” situations. Here’s an example of what a “-3” linkage means. Meeting the resilience targets for climate action in SDG 13, in the wrong way, could make it very hard to reach some of the marine conservation targets under SDG 14. If you just build sea walls instead of protecting and restoring salt marshes, changing urban land use patterns, and doing ecosystem-based management in off-shore areas, you might keep out sea level rise — but you’d be degrading life in the sea. It is a much better solution, from a systems perspective, to take the second, more integrated approach. A systems-based, sustainable development approach is usually a more challenging planning exercise than just building a big sea wall. But the sustainable approach brings multiple benefits: protection from the effects of climate change, secure livelihoods for people working in fisheries, and healthy ecosystems that support nature as well as tourism and other economic activities. Using a true sustainable development approach can turn that -3 into a plus — if the right decisions and actions are taken. Of course, the difference between building an expedient but damaging sea wall, and pursuing a more synergistic, sustainable approach, comes down to who is deciding, and how the resources are allocated. The ICSU report highlights these crucial dimensions of power, money, and social engagement by pointing squarely at SDG 16 (good governance) and SDG 17 (about forming partnerships and securing the financial and technical means to implement the other goals). 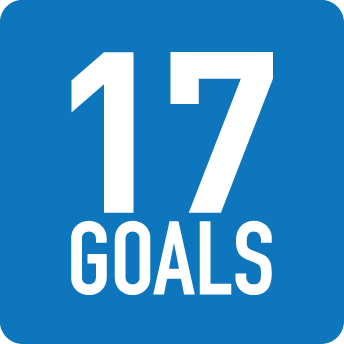 [SDG 16 and 17] are key to turning the potential for synergies into reality…. For many if not all goals, having in place effective governance systems, institutions, partnerships, and intellectual and financial resources is key to an effective, efficient and coherent approach to implementation. I hear the word “leadership” in that last sentence, a word that is often strangely missing from both scientific and UN documents. Because clearly, we will not achieve SDG 16 and 17 without good leaders. That makes leadership itself a crucial — and deeply inter-connected — element of the 2030 Agenda. This is a report that I am going to be reading slowly, absorbing over time, and using as a reference in my consulting work. It is full of useful nuggets of analysis, case studies, and practical solutions to complex problems, like the one above. For anyone who has struggled with the question, “What does integration mean in practice?”, this timely report provides guidance. Let it stimulate your thoughts, help you make connections — and then go lead (or participate in) some system-smart change effort that is more likely to create multiple benefits for your organization, your community, and your piece of the planet.